Are you looking for a dance floor with a traditional feel that's reminiscent of classic ballrooms? Why not consider an oak Parquet setting, made of small, elegant polished oak tiles? if you're planning a wedding or evening gala at an indoor venue with no dedicated dance floor, you'll want to provide one that matches the nature of your event, and the smooth Parquet style perfectly fits the bill. With Bybrook, you can get reasonably-priced Parquet dance floor hire in a variety of sizes for your next party. We make sure that you can get the elegant atmosphere you want for your party without breaking your budget. You also won't have to worry about setting it up or taking away once the event is over - we'll sort everything out for you from start to finish. The dance floor is where some of the biggest memories of your event will be made, from first dances with your new spouse to twirling around with friends at the end of the night. Make sure that you've got the perfect pitch to create an event to remember. 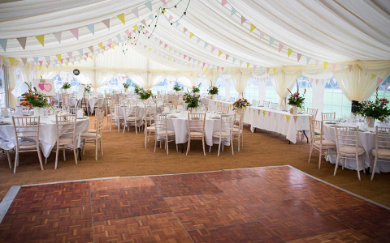 Choose Bybrook to get Parquet dance floor hire that's ready to go for your big day. We'll take the hassle out of getting the party started - just remember that it's on you to supply the DJ! If you would like to know more about the Bybrook Dance Floors service please call us now on 0116 253 0888.